Southampton’s most exciting technology start-ups, who are residents of the University’s innovation centre, pitched to some of the biggest corporates in the country at a brand-new event in London last week. The event, run by SETsquared, a partnership of the universities of Southampton, Bath, Bristol, Exeter and Surrey, saw 20 of the South’s most innovative start-ups pitch to the likes of Barclays, BAE Systems and Intel. 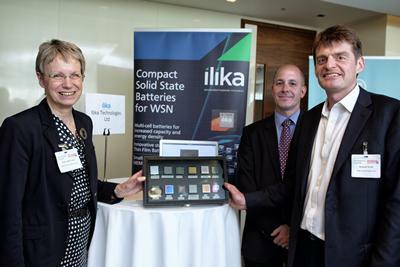 Among them were five Southampton companies, including University spin-out Ilika Technologies, who are members of SETsquared’s incubation programme and residents of the University of Southampton’s innovation centre. Professor Judith Petts, Pro Vice-Chancellor (Research & Enterprise) at the University of Southampton, attended the event to support the companies.